Oldham Coliseum is seeing the return of a local favourite. 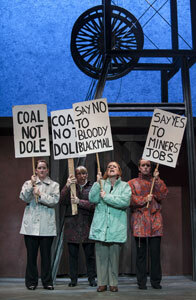 Adapted by Paul Allen from the celebrated 1996 movie starring Pete Postlethwaite, Brassed Off is a working class commentary about the closure of the coal mines in the 80s, centering around Grimley’s brass band and the effect terminating their local mine will have on their lives. 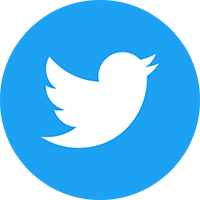 It deals with break-ups, suicide, worthlessness, emasculation and unfair segregation. The story has been credited as promoting brass band music, but the real triumph is its unforced but articulate criticism of the Conservative government’s decisions at the time. It is poignant and condemning, but also very funny and heartwarming at times. The play is accompanied by a live brass band on stage, who in many ways are the star of the show. 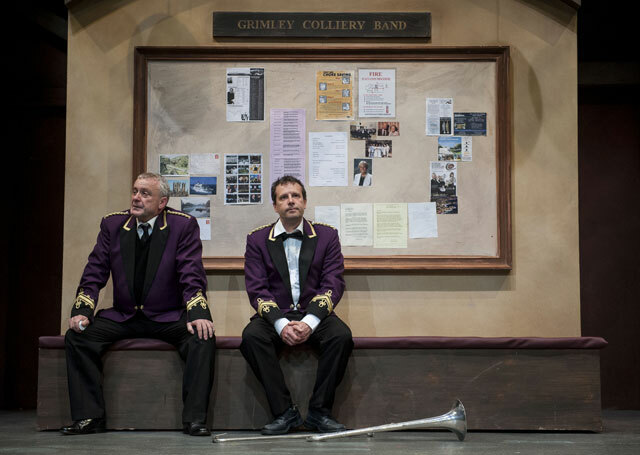 Without real live music and a full band for the marching and rehearsal scenes, the play would undoubtedly feel quite sparse – they are their own character within the performance. One example: the players do less-than-satisfactory renditions of certain musical sections when it’s necessary for the story for passionate conductor Danny to tell them off. I saw Delph band who have just finished their run, and they were excellent. The other bands to play will be Diggle (13th-17th September), Oldham (Lees) (20th-24th September) and Boarhurst Silver (27th September-1st October). All good bands, so whoever you see you will be in for a stellar performance. It’s easy to make critical comparisons with the film performances, but not many actors compare favourably to Pete Postlethwaite or Ewan McGregor. The cast are more or less consistent, but if I had to pick a standout performance I’d go with Natalie Grady who does a great job of playing Phil’s (rightfully) overwrought wife Sandra. We don’t resent her in any way when she decides to leave him. Thomas Weir also makes for a very endearing 11-year-old Shane. Oldham Colesium itself is a nice, traditional theatre. A decent size, but not quite big enough that any stage actors worth their salt would need a microphone. That said, when competing with a full brass band there are a couple of occasions when a mic might have been a good idea. Overall though the climactic marches do get a chance to breathe before we return to hearing the characters joke, moan or bicker. 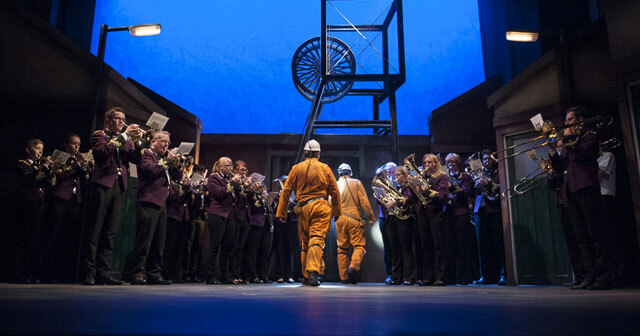 This theatrical performance of Brassed Off is as you would expect if you’ve ever seen it before or seen the film. There’s nothing new really done with it and the script doesn’t deviate. But this was definitely intentional – if they had tried to mess with it, especially in a town so close to Saddleworth and its march culture, there would no doubt have been uproar. 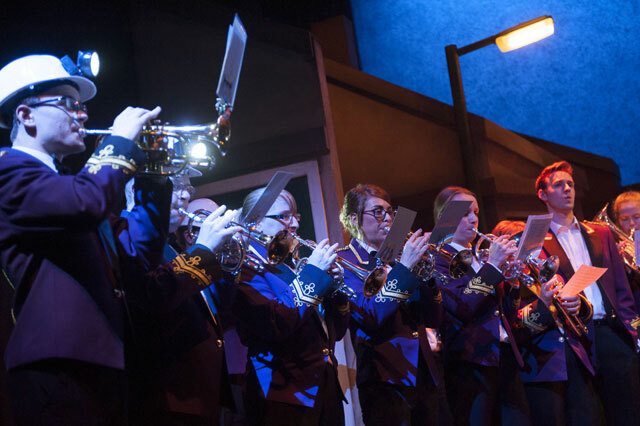 If the play showed us anything, it’s that brass banders can get bloody rowdy. Predictable if you already know the story, but then did it really need changing?